TAIPEI -- Some time over the next few weeks, a spire rising atop a skyscraper in Taipei will inch past Malaysia's Petronas Towers, making Taipei 101 the world's tallest building. It took more than good luck for the building to reach such an exalted height -- and its owners plan for it to stay around long after its world record is broken by other developers. As soon as C.Y. Lee and Partners architects finished a draft design for the 1,667-foot-tall Taipei 101, which is meant to resemble the sturdy bamboo stalk, developer Harace Lin sent for a feng-shui master. "We wanted to avoid making any mistakes," said Lin, president of Taipei Financial Center Corp., a consortium of the island's leading banks and insurance companies that helped bankroll the $1.7 billion tower that will house a shopping mall, offices for 12,000 people, and the Taiwan Stock Exchange. Although Taipei 101 will not be entirely finished until November of next year, the 101-story tower is already four times as tall as its nearest neighbors and dominates Taipei's skyline of mostly low-rise gray concrete blocks. A 197-foot spire to be added in mid-October will make Taipei 101 taller than Malaysia's 1,483-foot Petronas Towers. The Taipei skyscraper also boasts the world's fastest elevators -- 34 double-decker shuttles that can zoom at 37 miles per hour and take passengers to the 90th floor in less than 39 seconds. Divided into eight canted sections -- a lucky number to the Chinese -- the tower is sheathed by a wall of tinted glass that reflects the sky and is embellished with traditional Chinese "ruyi" symbols, spoon-like figures of fulfillment and contentment. It also faces the South, an auspicious direction. "We designed this building based on the philosophy of integrating with nature," said C.P. Wang, architect and project captain. "It's like a plant growing to reach the sky. This is very different from the Western idea of conquering nature." The only feng-shui problem, Wang said, was a perpendicular road that ran straight into the building's site, which could bring sickness or bad business to occupants. That was easily fixed by adding a fountain to block off the road. "Feng shui is part of our culture, so we built these symbols to help people feel lucky," he said in an interview. A big challenge was to make Taipei 101 strong enough to withstand the typhoons and earthquakes that plague Taiwan. "The environment we're facing is probably the toughest in the world for very tall buildings," Wang said. The result is a "megaframe" for the first 62 floors consisting of giant steel columns filled with high-strength concrete. The rest is light, made mostly of steel and glass. Lin said the tower is designed to endure the strongest earthquake in a 2,500-year cycle -- the industry standard is 400 years -- or tremors measuring above 7 on the Richter scale. Taipei 101 can also resist the biggest typhoon in a 100-year cycle, or gale force of more than 180 feet a second, he said. And if a plane plows into the tower, like in the Sept. 11, 2001, attacks on the World Trade Center, Taipei 101 "will stay up much longer for people to escape," Wang said. The Taipei 101 Building may be the world's tallest building, but it is not great architecture. It barely qualifies as mediocre architecture. 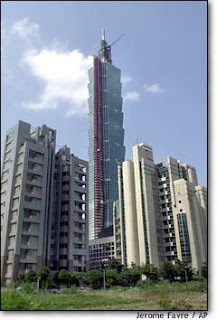 The Taipei 101 Building incorporates leading edge technology. The world's fastest elevators rocket tenants to their lease floors at a record 37 miles per hour. Once they have arrived, state of the art tuned mass dampers neutralize potentially catastrophic typhoon or earthquake induced swaying. These achievements however are engineering, not architectural achievements. The credit for them accrues to the engineers, not the architects. Great architecture is not about sheer size. If sheer size made for great architecture, Boeing's Aircraft Assembly Plant in Seattle, the largest enclosed space in the world, would be prominently displayed in architectural history books. Great architecture is not about engineering prowess. If engineering prowess made for great architecture, the English Channel Tunnel or "Chunnel" would be hailed as an architectural masterpiece. Great architecture is not about either scale of construction or engineering prowess. Great architecture is the creation of emotionally resonant forms of human shelter. First generation modern masters Frank Lloyd Wright, Mies van der Rohe, and Le Corbusier each at one time or another, designed diminuitive architectural gems that were neither the tallest, nor the longest, nor the widest in the world. They were merely the most emotionally affecting and inspirational. Unfortunately their achievements have seldom been matched. The ideal I describe is admittedly a tall order. That this exalted ideal is seldom achieved is why neither Taipei 101 nor the now defunct World Trade Center Twin Towers qualify as great architecture. The venerable, seven decade old Empire State Building is not great architecture either. It is an Art Deco period piece of average quality, clearly inferior to its more stylish predecessor, the Chrysler Building. But compared with the World Trade Center and Taipei 101, the Empire State Building comes off pretty well. As I have lamented before, this is depressing evidence of declining standards. What makes the Chrysler Building and the Empire State Building aesthetically superior to the WTC Twin Towers and the Taipei 101 Building? These rival Art Deco skyscrapers combined three important visual characteristics: one, vertical continuity; two, vertical emphasis; three, progressive setbacks. By vertical continuity I mean the continuity of the primary building mass is maintained from top to bottom, allowing one to experience the building's full height. By vertical emphasis I mean that the building's design elements collectively underscore the building's vertical axis over its horizontal. By progressive setbacks I mean that lower flanking masses help dramatize the commanding height of the central building mass. None of these visual characteristics desirable in a modern "point tower" are present in the Taipei 101 Building. Taipei 101 lacks vertical emphasis. Each of its eight canted sections has a self-defeating horizontal emphasis. Taipei 101 lacks vertical continuity. Inappropriate horizontal design motifs at the top of each canted section destroy vertical continuity, making Taipei 101 look as if it might fracture where one section ends and the next begins. Taipei 101 lacks progressive setbacks. Progressive height-enhancing setbacks do not appear until one reaches the rooftop antenna. 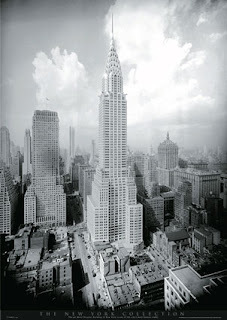 The Chrysler Building was completed in 1930. The Empire State Building was completed a year later in 1931. At the time of completion, each building was the tallest in the world. The designers of the Chrysler and Empire State buildings understood that being tall was not enough. A tall building couldn't merely be tall, it had to look tall as well. The designer of a tall building, they knew, must never negate a building's fundamental nature, not even inadvertently. The designer should always acknowledge, underscore, even dramatize a tall building's height. The 101 story high Taipei 101 Building may be the tallest building in the world, but it sure doesn't look the part. The client obviously coveted the title of "World's Tallest Building" and was willing to pay handsomely for the bragging rights. The fact that Taipei 101 doesn't look as tall as the considerably shorter, considerably older Chrysler and Empire State buildings is an embarrassing indictment of those responsible for its external design. In all fairness to the designers of Taipei 101, the building does have one saving grace, a reasonably well-designed, reasonably attractive adjoining shopping mall, probably the best in Taipei. 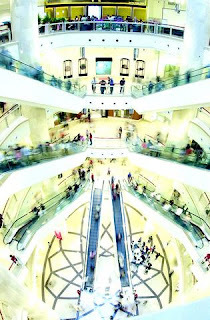 The nearly completely leased shopping mall is where the designers of Taipei 101 were the most successful. How exactly does an architectural designer make a tall building look tall? One of the most obvious and effective ways, albeit not the only way, is the way a fashion designer makes a suit of clothes look long, with vertical stripes. This is the previously mentioned vertical emphasis, but it is not quite as straightforward as it sounds. The elevations of the ill-fated World Trade Center towers were nothing but closely-spaced, thin, white vertical stripes. Unfortunately these vertical stripes were too closely-spaced, too thin, and too white to read as discrete design elements. They registered instead as one giant, blurry moire pattern. 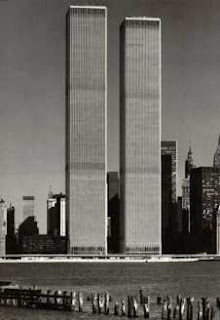 The result was the Twin Towers were immense, scaleless, boring expanses of blank wall. When the Twin Towers were completed back in 1973, critics joked that they were the discarded boxes the Chrysler and Empire State buildings came in. Yes, these vertical stripes were essential components of an innovative load-bearing wall system. Yes, they had to be spaced a mere 22 inches on center for structural reasons. No, that does not excuse the fact that as designed they amounted to an aesthetic disaster. Sound engineering is a necessary but not sufficient condition for good architecture. 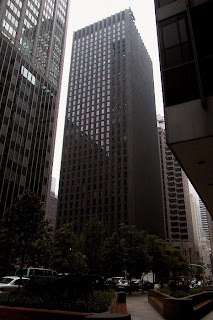 Eero Saarinen's CBS Building, aka "Black Rock," by contrast, was a success. Aesthetically Minoru Yamasaki's flimsy white mullions on the WTC didn't work. Saarinen's massive black piers did. Obviously something present at CBS was missing at WTC. That something was mass; perceived mass and actual mass. CBS had it, WTC didn't. Ironically the 9-11 terrorist attack would affirm the intuitive wisdom that "If it looks right, it probably is right." In 1945, the Empire State Building survived the direct, head-on impact of a USAF B-25 Mitchell bomber lost in the fog. As the entire world knows, neither of the WTC Twin Towers was able to survive similar impacts by hijacked Boeing 767s. According to Taipei 101's designers, the canted sections are reminiscent of segments of bamboo. This is disingenous eyewash. Anyone who has ever seen bamboo cane knows that bamboo diminishes in cross section as it rises. Any given segment of bamboo is invariably smaller in diameter than the segment below. Taipei 101's canted sections are exactly the opposite. Unlike bamboo, they increase in cross section as they rise. 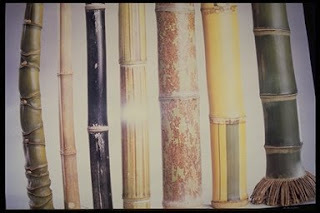 Unlike bamboo, each canted section is identical to the one below. Taipei 101's canted sections bear no resemblance whatsoever to segments of bamboo. Far from evoking the reassuring natural resilience of a stalk of bamboo, Taipei 101 resembles a precarious stack of children's building blocks, threatening to topple over at the slightest nudge. It is no excuse to say that the intellect knows this isn't so. Good design requires more than the creation of buildings that we know are stable. Good design requires the creation of buildings that we perceive as stable. The designers of Taipei 101 conveyed a highly undesirable impression of instability. Apparently they did so unintentionally, and are utterly oblivious about the extent of their design blunder. That is the saddest fact of all.